In the center of the bright lights of Reno, surrounded by the majestic Sierra Nevada Mountains, sits a new Nevada landmark: Welcome to Whitney Peak Hotel! 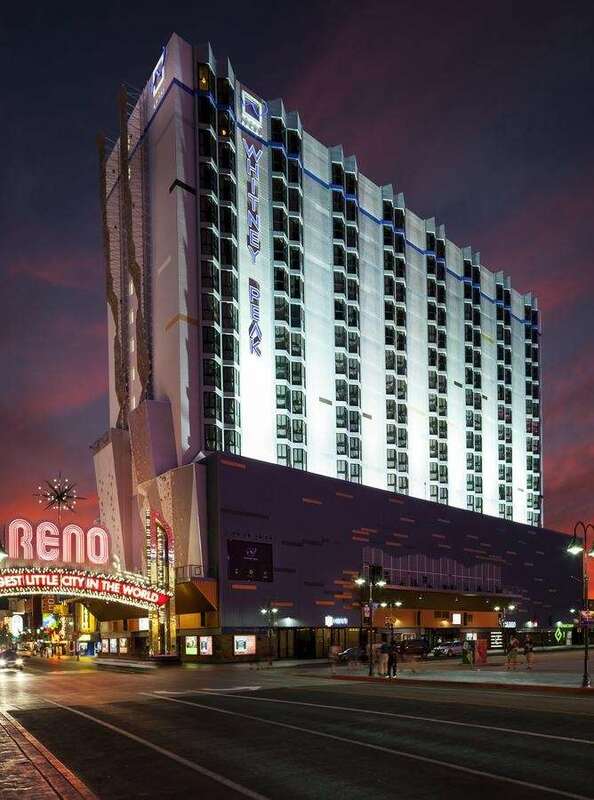 In the center of downtown Reno, Whitney Peak Hotel sits adjacent to the Legendary Reno Arch and is 30 minutes from the base of the Sierra Nevada Mountains. The hotel is located only 10 minutes from the Reno-Tahoe International Airport. Whitney Peak Hotel features 305 guest rooms and 19 suites, Heritage full service restaurant and bar serving breakfast, lunch, dinner and weekend brunch along with a world class music venue, Cargo. Whitney Peak Hotel is also home to BaseCamp a 7,000 sq. ft. interior boulder park with the worlds largest exterior climbing wall. Whitney Peak Hotel is turning Reno outside in and is non-smoking and non-gaming. Whitney Peak Hotel is bringing new life to downtown with concierge level accommodations, great views and a variety of room types featuring one king bed or two queen beds. Amenities are unlike any other hotel in Reno: 1. BaseCamp: world-class bouldering and climbing, including the worlds tallest exterior climbing wall. 2. Cargo: hip, new concert venue that will bring the best in indie rock, performance art and live music. This space can also be rented out for banquets, weddings and corporate meetings. 3. Heritage restaurant that will feature locally grown foods and area wines/local craft beer Whitney Peak Hotel will offers guests the unexpected while bringing together organic design, the great outdoors and a vibrant music scene. The hotels team will connect guests with the very best the region has to offer, whether biking, hiking, skiing or fishing. Our team looks forward to welcoming you as we blaze new trails for Reno!